Ryans Self Drive car hire in 1963 & 1964. Both of these leaflets refer to Ryan's Self Drive car hire, a firm with a head office in Dublin, and smaller offices located at Dublin airport, Shannon airport and also Cork airport. The older of the two leaflets describes the cars on offer for the 1963 season, the later covers 1964 and highlights a few updates to the Ryan fleet of hire cars, and is interesting to compare with those on offer by Mascot Motors at the same time, based in St Helier, Jersey. 1. Ford Popular (100E type), Renault R4. 3. Ford Anglia (105E), Morris 1000, Austin A40 Farina, Volkswagen 1200. 4. Hillman Minx, Morris 1100, Wolseley 1500, Fiat 1100. 5. Austin A60, Ford Consul, Vauxhall Victor. 6. Opel Station Wagon, Ford Zephyr IV, Minibus. A note under these classifications also hints at other, more prestigious, vehicles that could also be hired: "33.3% extra on Group 6 rates for Mercedes and Humber Hawk". Tariffs varied depending on whether you wished to hire a car in winter ("thrift season"), spring (mid season) or summer (high season). If, for example, you wished to hire a 100E in winter, with unlimited mileage, it would have cost £9.9.0 per week, compared to £15.15.0 for a Group 6 car such as the Zephyr. Hire the same Ford Pop in summer and instead of £9.9.0, you'd have to fork out £16.16.0 instead. A £5 returnable deposit was required on all car hire agreements. Ryan's Car Hire Ltd was the only firm in the area with an official link-up with BEA (British European Airways), confirmed by a small logo on the rear of the leaflet, which incorporated a saloon car, and what looks like a BEA Vickers Viscount. A catalogue explaining the BEA Car Hire Plan, for which Ryan's Self Drive was signed up to, can be found here. 7. Austin A60, Vauxhall Victor, Ford Consul. 8. Mercedes Benz, Humber Hawk, Minibus (9-seater). Anyone visiting Ireland during winter would be pleased to note that all chauffeur-driven cars came with heaters as standard, and roof racks were free of charge. The following year, 1964, would see some amendments to the fleet list and revised groupings for all their cars. 2. Austin Mini (no longer referred to as a '7'). 3. Ford Anglia, Morris 1000, Hillman Imp, Volkswagen 1200. 4. Fiat 1100, Austin A40, Wolseley 1500, Vauxhall Viva. 5. Ford Cortina (Mk1), Hillman Minx, Triumph Herald, Austin A1100. 6. Opel Station Wagon, Austin A60, Vauxhall Victor. The smiling young lady on the cover of the '63 leaflet had been replaced with a stacked-headlamp Mercedes Benz, and the leaflet no longer mentions the 100E Pop - Ford fans would have the make do with the 105E instead. The tiny entry-level NSU Prinz was available for £8.8.0 per week during the winter season, with unlimited mileage, undercutting the previous entry point price of the 100E at £9.9.0. The hire rate for the Mini remained at £10.10.0 (winter), although some others had risen in price, for example the Hillman Minx - £12.12.0 in 1963, and £13.10.0 for 1964, again both winter rates. All cars came with a full tank of fuel, and it was the hirer's responsibility to return it in the same state - the quoted fuel price was 5 shillings per gallon (25p) - a little different to today's prices.. Chauffeur-driven cars were now grouped into A, B, or C depending on the size of vehicle, but otherwise remained the same as those specified in '63. 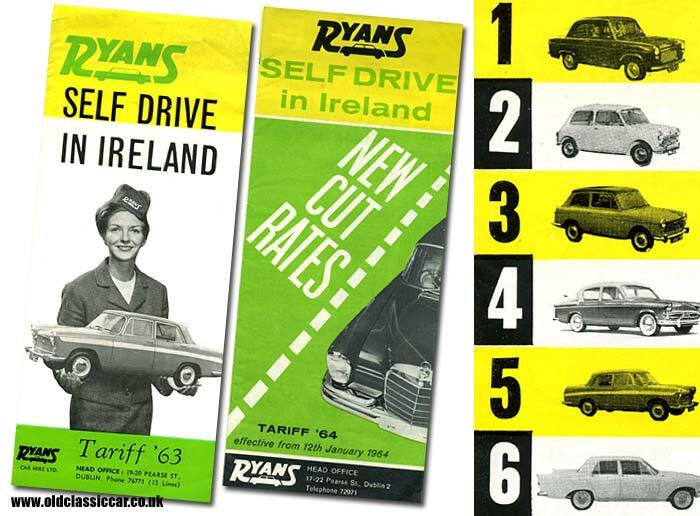 A flyer for 1964 advises that Ryans Self-Drive was Ireland's largest car hire firm at the time, with a fleet of 480 vehicles sourced from 21 manufacturers. In case you were in two minds about a visit to Ireland, Ryan's offered the following advice: "Ireland is given its temperate climate by the Gulf Stream. It has no extremes of temperature and is as green as the Ballads say". Quite which ballads these are is left to the reader to work out. Return to the Motoring Collectables section for more classic items with a motoring link to them.